The sleeve note for this album advises that the musicians recorded most of the tracks in one day, after a Late Late Show gig at Ronnie Scott’s. Without that information, the listener would have no clue to the circumstances that were involved in putting together this hugely enjoyable collection. There is not a hint of tiredness or apathy from the first note to the last. The sprightly bop rhythms are convincingly underpinned by Steve Brown’s unobtrusive but utterly sublime drumming. 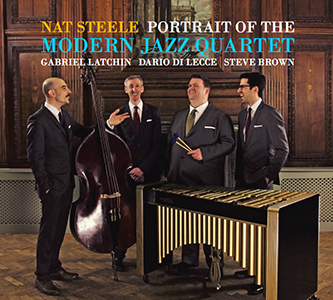 Mingled in with the equally vital but understated double bass playing from Dario Di Lecce, the two provide a musical bed for Nat Steele’s vibraphone and Gabriel Latchin’s piano to lie on and luxuriate in comfort. By the time the band hit the La Ronde Suite, it sounds as though everyone is firing on all six, possibly seven or eight cylinders, judging by the awesome dexterity demonstrated by each musician as they weave in and out of the melodies. There are two ways to listen to this album. The first is simply to enjoy the wonderfully melodic joyfulness which the band bring to their selections. It is an uplifting sound, each track underlining the pleasure of the last, and then building more pleasure as the record unfolds. The second way to enjoy it is to play it again and concentrate on each individual musician’s contribution – the interaction that sounds so effortless and simple but, as experienced jazz fans will know, indicates that it is actually anything but. Each player gets to step out from the ensemble format and showcase his own unique abilities, but it is never done with any sense of ego or grandstanding; these musicians are far too aware of their individual and collective abilities to need to play in a way that ever approaches showing off. They play with ease, verve, and skill, but they constantly serve the melody and sharp bop timing that runs through this album like gold thread through a colourful tapestry. The vibes-playing on the deliciously swinging Django provides a sense of musical mischief that the maestro would have appreciated, and the following Bags Groove, Milt Jackson’s classic, once again showcases the way the players interact as though by instinct, which it probably is, and by experience and pleasure of playing, which it certainly is. If this album sends new converts out to explore the MJQ’s catalogue, and brings new fans to this wonderful combination of joy and skill, then it will have done its job. If it stands alone as a classy piece of ensemble playing on its own merits, then that’s just fine too. They played live last autumn at All Saints church in Hove and sounded really great!